LOS ANGELES—For nearly 40 years, Paul Morantz has waged an intense war against cults that have used sophisticated brainwashing techniques to induce followers to surrender their assets, their moral compasses and even their lives in exchange for false promises of a better world or some divine reward. It was a war that nearly cost him his life. 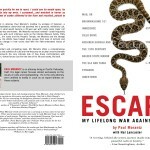 In “Escape—My Lifelong War Against Cults”(Figueroa Press), Morantz, a Pacific Palisades, Calif., lawyer, tells the story of his career in this unusual legal niche and how it affected his life, including a chilling retelling of the attempt on his life orchestrated by Charles Dederich, the founder of Synanon, a once-acclaimed drug rehabilitation program that evolved into a paranoid, militaristic cult. In 1978, in the midst of a ferocious legal battle that consumed nearly 10 years of his life, Morantz was bitten by a rattlesnake placed in his mailbox by two members of Synanon’s so-called “Imperial Marines.” He survived, thanks to the quick actions of neighbors, paramedics and doctors and 11 vials of anti-toxin. But Synanon was only the beginning. In one way or another, Morantz has been involved with nearly every major cult that has emerged in the U.S. since the 1960s, from the Charles Manson family to Jim Jones’ People’s Temple to the Church of Scientology. He has spent most of his career fighting to free victims of abusive and often violent sects, to curb the abuses of destructive organizations through ground-breaking litigation and to educate the public and the legal community on the dangers of cults and brainwashing. His efforts helped change long-held misconceptions and outdated laws pertaining to cults and brainwashing. In the book, Morantz offers a primer on the origins of brainwashing techniques and detailed backgrounds on a host of cults, all filtered through the prism of his involvement. He tells of a polite young man he befriended while working a summer job after college who later became a chief lieutenant in the murderous Manson family. He provides a unique perspective on the still-bewildering story of heiress Patty Hearst, who was kidnapped by the Symbionese Liberation Army, but later joined with her captors in a crime spree that concluded with a deadly shootout with police. He recalls the bizarre tale of the Oregon guru whose followers attempted to poison an entire town. Other organizations profiled include the People’s Temple and the mass suicide, est, Center for Feeling Therapy, which developed a new-age form of psychotherapy that leaned heavily on physical abuse and inappropriate sexual behavior; the sordid tale of John Gottuso, a pastor and psychologist who used his position to sexually abuse women of his congregation for nearly four decades; and Scientology, the longest-running and most successful cult in history, with its bizarre, science-fiction-based origins and its connection to movie stars John Travolta and Tom Cruise. Morantz also points out elements of today’s political, economic, social and religious environment that he believes is leading us into a new era of cults, including some surprisingly totalist behavior by our last two presidents. 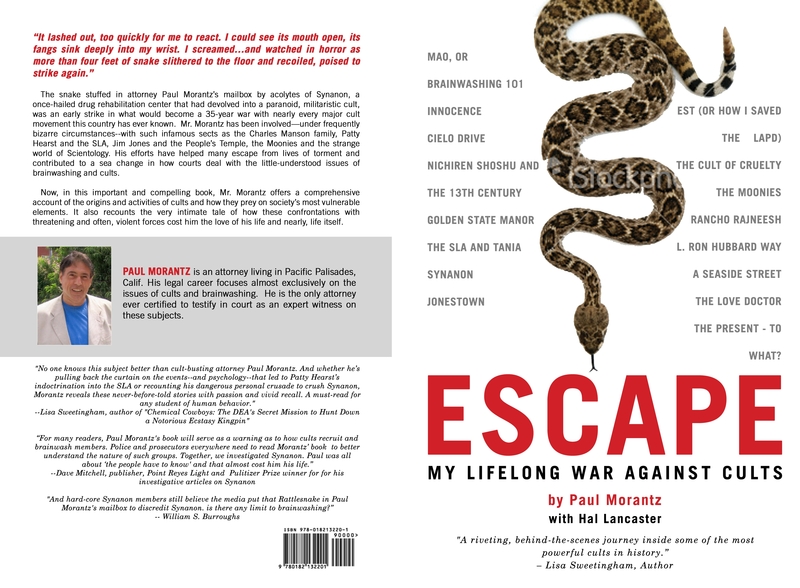 Through all these tales, Morantz, along with co-author Hal Lancaster, weaves in the deeply personal story of how he became involved in this unusual career and the steep price he paid for his single-minded dedication to this fight—the loss of his personal life, the woman he loved and almost, his life. Hal Lancaster spent 30 years as a reporter, editor, bureau chief and columnist for the Wall Street Journal. He is now retired. The two have known each other since their days at the University of Southern California School of Journalism and share a cult-like devotion to USC football. Book is now in stock on Amazon. search under “Paul Morantz.” Not subject tagged yet. For more information, review copies or interviews, please contact the authors.